For the past several years NEHGS has been giving seminars on writing and publishing a family history. These have been very popular, and as a result, Penny Stratton and I refocused the two previous NEHGS writing guides to reflect the contents of the seminars. 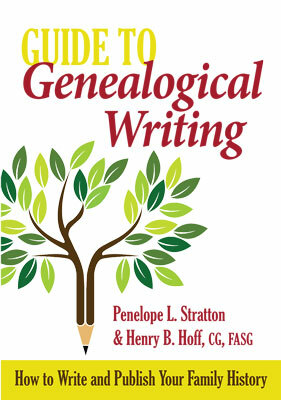 The resulting book is the Guide to Genealogical Writing: How to Write and Publish Your Family History (Boston: NEHGS, 2014), just released. In twelve chapters this Guide covers everything from preparing a short informal booklet up to publishing an elaborate compiled genealogy. Chapters on writing for the Register and for American Ancestors were adapted from the two previous guides. To help readers visualize some of our specific examples, we included plenty of illustrations, most of them from recently published Newbury Street Press books. And we think readers will find the “Genealogical Manual of Style,” twenty-five pages summarizing different writing and style issues, to be particularly helpful. We were careful to emphasize that the contents of the Guide are largely suggestions, not rules written in stone, and that sometimes it is more important to be consistent than to follow how NEHGS does things. Some of the chapters were beyond my knowledge (especially design and layout), but I rarely lacked an opinion. Nevertheless, much of my input was editing – watching for the mistakes that can easily creep into a book like this, like changing something in one place but not another, or being inconsistent between chapters, text, footers, illustrations, and the Genealogical Manual of Style. My single contribution to the illustrations was from the draft of a book in process with comments to myself in bold caps. I made sure to read my comments to make sure none were outdated, obvious, or otherwise embarrassing! One of the valuable aspects of the Guide to Genealogical Writing is showing the interested reader what are possible choices. Anyone considering writing a family history should study the Guide carefully, and then look at some examples of Newbury Street Press books for ideas as to how the end result might look, even if produced inexpensively. One size definitely does not fit all, and when thinking about writing a family history, one needs to consider what different aspects of various genealogies are appealing – and feasible. Having a co-author for the Guide was definitely the way to go, I believe. Penny and I had different strengths, and while she could have done it all by herself, having me as a co-author to look at and discuss every new set of changes was valuable – or so she tells me! Just ordered and looking forward to it! I pre-ordered this excellent book and have already read through it. It’s an excellent reference tool and has helped me to organize my thoughts on several writing projects I have in mind. Thanks for a great book and congratulations on a wonderful collaborative effort!